I designed a pullover sweater for once! Some of you may have seen this one at the Ravelry party at Rhinebeck! A cozy top-down pullover with a henley neck and long patterned collar and cuffs, worked in easy to wear superwash merino. The versatile collar can be left open for a deep v-neck, buttoned up all the way for a warm turtleneck or scrunched funnel neck, or somewhere inbetween! Tephra features waist shaping only on the back of the sweater for a cozy not-too-fitted look. Shown in size 37” / 94cm with no ease. DK weight or light worsted, shown in Tanis Fiber Arts Yellow Label DK. 7 page colour PDF includes photos, charted and written directions for Lacy Block Rib, schematic and abbreviations. This pattern features fill-in forms – fill in the numbers for your size! This pattern is split into 2 files – one contains sizes 31-41”, the other 43-57”. You will receive both files. 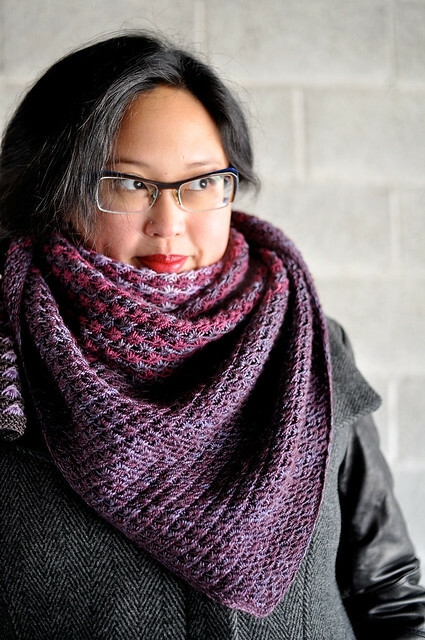 Cast on, knit, purl, increase and decrease, knitting in the round, short rows. Suitable for an intermediate knitter. Beautiful! I love the versatility of the neckline, brilliant! Yet another of your patterns I’m going to be knitting :) As soon as I finish my Castlegar, this one’s going on the needles! I love this one! It’s going straight in the queue. :) Congratulations. Very pretty pattern. 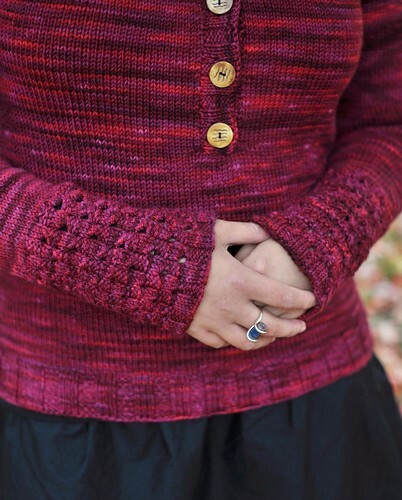 I really like the stitch pattern on the collar and cuffs. Very feminine. Another one of your designs I want to start knitting straight away. shown in 37″..that would be 94 cm not 89, I can’t let that stand uncorrected, sorry. :) But I love the sweater! This is a great sweater Laura! I love the Peter Pan collar and the lace details. Great photoshoot as usual! I’m so glad you posted ALL these photos as I got very excited to see the pullover pulled up and buttoned up around the neck — perfect for winter!